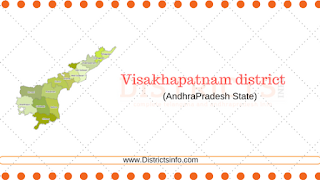 Visakhapatnam district Profile ,Mandals and Tourist Places in AP State: Visakhapatnam district is one of the crucial districts in north coastal districts in Andhra Pradesh. It has Odisha on the north side, east Godavari district on the south, Odisha on west and Bay of Bengal on the east as borders. Visakha district can be divided into three parts, the rural area, urban area and the agency area. Visakhapatnam district is spread over an area of 11,161 kilometers. Forest are is 42.1 percent. 36.1 percent land is useful for agriculture. The district is divided into three revenue divisions and forty-three mandals. The climate is different from different regions in the Visakhapatnam districts. Coastal areas are very humid and agency areas are very cold. Temperature is more from April to June. Visakhapatnam district is the second district to receive the highest rainfall. One out of three parts in the district is forest region. More than seventy percent of families in the district depend on agriculture. Visakhapatnam city is growing very fast industrially but the rural areas are still very backward. Rock phosphate, bauxite, calcite, Quartz minerals are available in the district. According to information available about Visakhapatnam district history, there are different stories why the place is called Visakhapatnam. The city is spread around the temple of Visakheswar and this is why it is called Visakhapatnam. Another belief is that the name came after Ishaq Madina dargah. There are different arguments that Visakhapatnam existed a since few hundred years ago but tremendous growth is seen in this century only.  Kailasagiri: Kailasagiri hills I spread in around 350 acres and beautiful park is developed here. Water fountains, microwave repeater station, flower clock and Titanic Viewpoint mesmerize the visitors. There are huge idols of Shiva and Parvathi. Special attractions of Kailasagiri are the ropeway and the circular train.  Ramakrishna beach: Ramakrishna beach is very suitable to get relaxed. There is a Kalimata temple nearby which is must a must see the place for the tourists.  Kurumpam tomb: This tomb is built in the memory of Kurumpam queen. This is popular as Taj Mahal of Visakha.  Submarine museum: This is the first of its kind in Asia and second in the world. Kurusura Submarine museum is located near Ramakrishna beach.  Rishikonda beach: This is at a distance of 8 kilometers from Visakhapatnam and is a place to be visited. Twelve AP tourism cottages are available here for the tourists.  Totlakonda is 15 kilometers away from Visakhapatnam and is 128 kilometers above the sea level.  Simhachalam is 16 kilometers away from Visakhapatnam city. It has nearly six hundred years of history. Devotees believe that Narasimha Swamy resides on this hill. Thousands of devotees visit this temple every day.  Nukambika temple is at a distance of 36 kilometers from Visakhapatnam. Devotees come to visit this temple from Odisha, Maharashtra, and Karnataka districts also.